This is exactly the kind of place that I love / adore. The balance between the atmosphere, interior design, service and food is just perfect. I have to say that I find this with a lot of places in New York. Anyway, this one rocked my world even more. I had a group dinner here so we had a very nice separate room upstairs. 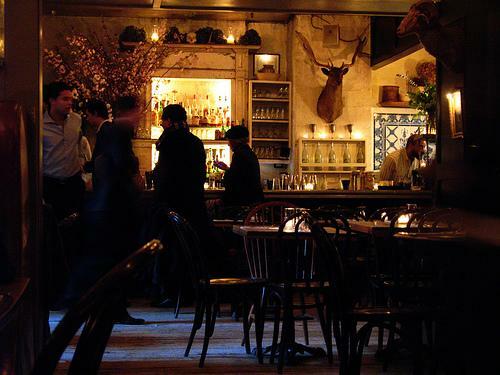 The whole space is made incredibly cozy with a rustic candlelight interior and curiosities hanging on the walls. Also, the restaurant is tucked away in an alley and this secret element adds to the place’s funky identity. Don’t leave without having tried the artichoke dip.. It will make you want to empty the bowl with your fingers like a 7 year old kid that helps his mummy cooking! Divine!